Gundam.info has announced the results of the Master Grade Ver.Ka poll! The poll ran between 9/26 to 10/2 and will help them decide what is the next Master grade Ver.Ka is after they released the HWS (Heavy Weapon System) Hi-Nu Gundam. The winner is ZZ Gundam! In my opinion, out of all the choices, this is possibly the best possible outcome because most of the Gundam’s that are on the list already have had a Master grade in the last few years. The last time that the ZZ Gundam had a master grade kit was way back in December of 1999. Then the full armor came out nine months later in August 2000. The poll received close to 10,000 votes and they go on to say that many people expect the best from master grade kits that bear the name, Katoki. 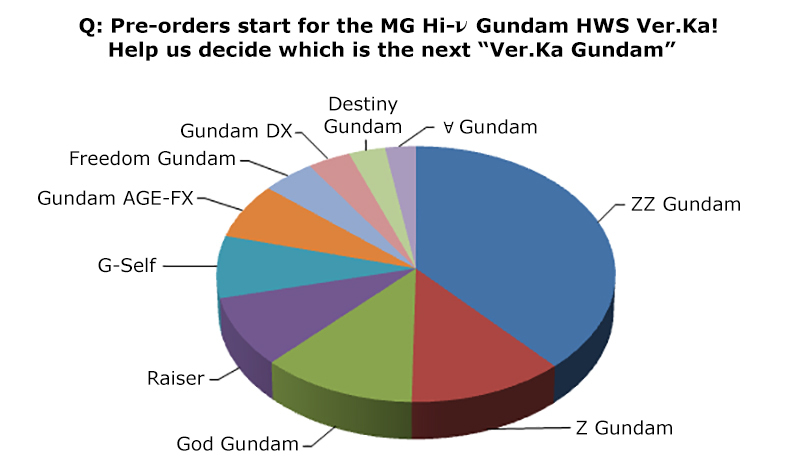 They tried to think of the best Gundam that would best benefit from the Ver.Ka treatment, so they decided to do this poll to help them decide. The article also mentions that it is the 30th Anniversary of the “Mobile Suit Gundam ZZ” anime and that many of the people who were fans of the show were in elementary school at the time and now they are parents and get to share this part of their childhood with their own children. It goes on to talk about the second and third place entries, the Zeta (Z) Gundam and the God Gundam, only being separated by a .1 percent difference. Being that the Zeta Gundam has a Perfect Grade and an MG Ver.2.0, we might not get a Master Grade Ver.Ka of this kit anytime soon. People were hoping that the ZZ Gundam would get the same treatment soon after and hopefully, that time has come. What do you think of the results? Did your vote win? Let us know in the comments!